When you interview a person, then you surely judge him for a set of skills such as his experience, work expertise, the ability to meet deadlines, and more. But what if you have to make that person work in a team, or probably lead a team? It is clear from this, that you have to test that interviewee for another crucial skill set, i.e., Teamwork. Working with a team might not sound very vital, but actually, it is an extremely crucial aspect that an employee must possess. Whether he has to be a part of the team, or he has to lead a team, it is necessary, that he is able to deliver productive output. So, now it is decided that you have to test the interviewee for his ability to work with a team, the next question is that how to do this? It is pretty much simple! Just like you ask the interviewee about different questions in order to judge his varied capabilities, similarly, you may ask him questions to investigate for his team player skills. But first, you may know that what all are the team player qualities that a good team player must possess. A team player should be reliable, so that other individuals can count on him. As a team player, the person must have the patience to listen and understand varying perspectives of other team members. Individuals can give you a defined constructive feedback, only if you don’t act defensive. It is essential that he is clearly and directly able to express his idea but in a respectful manner. A team player must always work with others in order to achieve the team goals. He should focus on the productive solution to secure optimal output as an end result. As an elite team player, a person has to show active participation in different events organized by the company such as activities, discussions, and more. It is necessary for a team player to show complete dedication towards work and accomplishment of goals. Flexibility is another very imperative trait of a team player. A team player must conveniently adapt to novel changes that have occurred based on direction or feedback of others. Lastly, a team player must be considerate enough to treat everyone with courtesy. So, when you ask the interviewee about different questions related to the teamwork, then these are the team working skills, for which you have to judge him. Therefore, you may now know about some very vital questions that you may ask the interviewee about the teamwork at work. 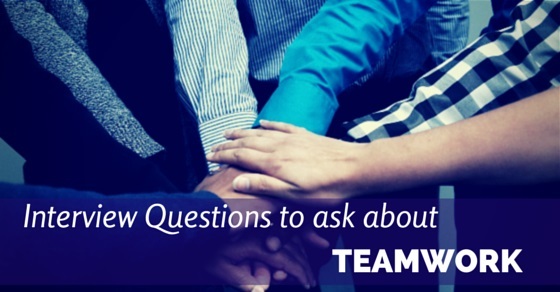 Some crucial interview questions about teamwork are outlined below. The following mentioned are few teamwork interview questions to ask at an interview and good team working skills any employee should possess. Foremost, it is necessary that you ask the interviewee about a successful project that he was part of, and what his role was in that project. You may also ask that why the project was successful. Next to this; you may ask the interviewee about two or more situations, when working with a team was beneficiary to achieve his personal professional goals as well as goals of the entire team. Investigate for situations, when the team served as the finest potential solution to resolve an issue. Question the interviewee about circumstances when his team successfully worked with a team of different department or worked with another group belonging to same department to accomplish the goals. It is not essential that you ask the interviewee only about situations when he was successful in a teamwork. You can also investigate for instances, if in case, he was a member of a team, which was not able to achieve success. In such case, what all assessments he made in order to know the reasons for the failure. In order to judge the interviewee about his flexibility trait as a team player, you may ask him for an example when he worked outside his normal routine, in order to fulfill a team goal. It may be possible that a team player had to adapt new changes during his previous working schedule. So, ask how comfortable he was during learning new skills. Was it challenging for him, or was he able to succeed in it comfortably. Ask the interviewee about various kinds of strategies, which he applied for accomplishing goals of the team. There might be distinct methods that he may have employed for successfully overcoming varying situations. There are times when the other team members are not willing to grant support and input that is required from them. In that case, it becomes difficult for a team to work as a whole. So, ask the interviewee that whether he has met such a situation, and if yes, then how he overcome it and manage to achieve team goals as well as company goals. You can request the interviewee to inform you about his biggest project as a team leader or as a team member. Question him regarding what has happened, the purpose of building a team and the results obtained from it. In order to know, how much he will be successful as a team leader or a team player, directly ask him for team qualities that he possess to work in a team. Ask him, that why he was selected to be in a team, during his previous job. If he had worked in a team in his past, then surely he must have met various kinds of problems related to the team. So, ask for all kinds of problems that he faced while being a team player or member. You may also inquire about solutions that he adopted to meet his team goals. Only working in a team is not essential. It is also vital, that he is able to perform well in a team. Therefore, you may ask the interviewee to rate himself on a scale of 1 – 10, as a team player. In case he ranks himself low or around 5, then you may also ask him about methods that he may employ in order to improve his performance. Even while an employee is working as a team member, it is essential that he is able to secure personal levels of growth as well. So, question the interviewee regarding his personal growth as a team member. If the resume of the interviewee highlights his experience as a team leader, then you may ask about total experience he possesses as a team leader. This is another very imperative question to ask. It will help you comprehend that whether the interviewee is comfortable working alone or in a team. It is of use, especially if you are planning to hire someone as a team leader. This question can help the interviewer to know what all aspects in a team are able to motivate the interviewee. It may also help the employer to know about ability of the interviewee to share ideas, ability to secure feedback from others, and ability to share the work and team skills with others working in a team. You can enquire the interviewee about situations or projects, which he was not able to complete on time, while he was working with a team. This is essential to know, how much committed, dedicated and organized he is when working with a team. It is also useful for testing his abilities regarding prioritization of different tasks, and communicates effectively. When working in a team then there are possibilities that a member engages into a conflict with any other member. However, this is not a good sign of an elite team player. So, make sure that the interviewee sitting in front of you has never met with a conflict, as then you have to look for another viable option for your job post. By these questions asked in an interview, you can judge that whether your candidate is a true team player or not. These questions asked during an interview will help you to assess your good teamwork skills and the candidate’s qualities. It will help you to understand how well he is able to work under different situations, and with personalities of different traits. So, make sure that you ask all such questions to the interviewee if you really want to recruit someone who is a leading team player and can bring benefits to the company.